One of my favourite things when cooking is finding new and interesting ways to use up any leftovers. It's a great way of avoiding waste, stretching your food budget, and discovering new recipes. Recently I had some leftover pearl barley which had been used as an accompaniment to a chicken casserole, and I wanted to use it up the following day. 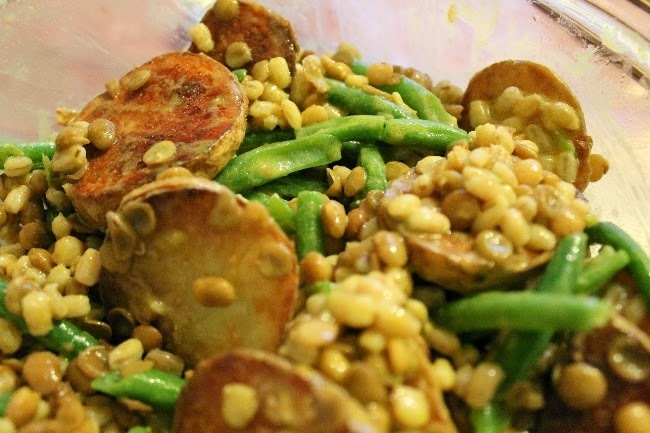 I went online and found this great recipe for a pearl barley salad. Although I didn't quite have all the ingredients, I was able to make a couple of substitutions and produce a really delicious dish. I'm presenting this to you less as a recipe (though by all means you can copy exactly what I did here if you wish!) and more as an example of how you can make a lovely dish out of leftovers and cupboard staples. I suggest you read the original recipe if you want to make your own, as I didn't really measure any quantities - I just threw in whatever I had. Also, my ramblings below might make a little more sense if you do! My pearl barley and lentils were both pre-cooked (barley was a leftover from the previous day and lentils were canned) so I drained the lentils and put both into a bowl; I used approximately 200g of each. I decided to sauté the potatoes rather than roast them as I didn't want to switch the oven on just for a couple of potatoes. I sliced two medium-sized white potatoes and fried them until golden, then put them in the bowl with the barley and lentils. Next I added a slug of olive oil, and a table spoon or so of lemon juice (out of a bottle rather than fresh, so I guestimated the amount that might come from a fresh lemon). I seasoned with black pepper, but left out the salt as the lentils were pre-salted. My green beans were frozen and I microwaved them for ease. Once cooked, I threw these in with the rest of the ingredients and gave everything a good stir. In a separate bowl, I mixed together a tablespoon of white wine vinegar, a tablespoon of English mustard, a tablespoon of olive oil and half a teaspoon of ground cumin. Lastly I poured this over the salad and mixed until everything was well coated. All of the substitutions were for ingredients that I didn't have, but if you looked at the original recipe you will also notice that I left out the tomatoes. This was just because I was using the salad as a side to a pasta dish which already contained tomatoes. Although I used it as a side dish on this occasion, it could quite easily be eaten as a meal in and of itself, perhaps with some lovely crusty bread to accompany it. Lentils are one of my favourite cupboard staples as they're useful for all kinds of dishes, and if you've never tried pearl barley before I'd really recommend it. At home we use it often in soups and casseroles, but it's great as a substitute for rice and there are loads of salad recipes online which I am looking forward to trying very soon. Again, all credit goes to What Katie Ate for the original recipe. Yum on sooo many levels! I'm going to make this with quinoa or rice (sadly barley isn't gluten-free, so I can't eat it) before the winter months wrap up. Once spring is here, I usually just want light or bbq fair until the first days of autumn's harvest. :) Thank you for sharing this tasty, filing dish with us, dear gal.